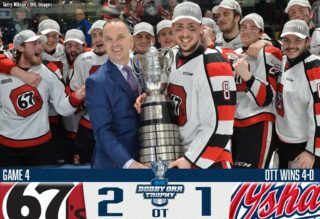 NHL Draft prospect Philip Tomasino (25) and Los Angeles Kings pick Akil Thomas (25, 26) each had three points as the Niagara IceDogs won their seventh straight contest, defeating the CHL’s ninth-ranked Soo Greyhounds 6-1. Niagara scored five times in the latter half of regulation as Oliver Castleman (14), Jason Robertson (35) and Ben Jones (29) also found the back of the net while Stephen Dhillon made 27 saves. Holden Wale (3) provided the lone Greyhounds goal as Sault Ste. Marie fell to 31-11-5-1. Niagara leads the Central Division by a 10-point margin, holding a 31-10-7-0 record on the season. 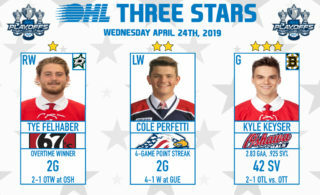 The Windsor Spitfires shook a five-game slide as Colton Incze made 38 saves in a 4-2 road win over the North Bay Battalion. Curtis Douglas (20), Ben Garagan (5), Luke Boka (9) and Daniel D’Amico (21) scored Windsor goals before North Bay replied with a pair of Luke Burghardt (4, 5) tallies in the third period. 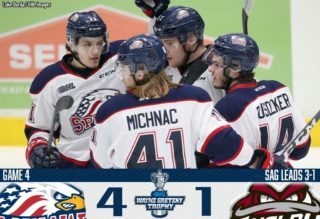 The Battalion outshot the Spitfires 40-37 but the Spits came out on top, starting a weekend road trip by improving to 21-26-2-1. The Battalion falls back to .500 at 23-23-1-2 for eighth in the Eastern Conference. The Sarnia Sting scored seven times on 30 shots, defeating the Barrie Colts 7-2 on the road. Sean Josling (12, 13) scored a pair of third period goals while Brayden Guy (16), Mitch Eliot (13), Jacob Perreault (24), Calvin Martin (11) and Franco Sproviero (16) also lit the lamp. 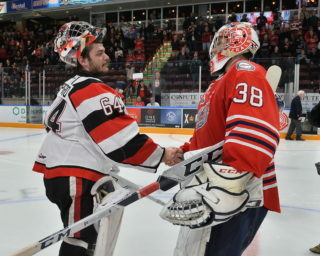 Hugo Leufvenius recorded a pair of assists for Sarnia and goaltender Cameron Lamour stopped 35 of 37. Ryan Suzuki (16) and Riley Piercey (2) scored Barrie goals as the Colts lost their seventh in the past 10 to fall to 20-25-2-0. Sarnia climbs into sixth in the Western Conference with a 21-22-5-2 record.